We offer packages of indulgence for the bride, groom and the bridal party. Choose from a simple hairstyle and make-up package or a more elaborate package featuring, a facial, massage, manicure, pedicure, hairstyling and make-up application. Whether you’re getting together with your bridesmaids to celebrate or it’s your wedding day, our team of professionals will do their best to make you feel gorgeous. *Bridal package pricing only available to bridal parties booking hair and makeup services for a minimum of five individuals. 20% discount has already been applied to the prices listed below. 20% off all Bridal Packages. Complimentary trial updo for the bride. Complimentary trial makeup application for the bride. Complimentary band lash application for the bride. “I had the most WONDERFUL experience recently at Mahogany (Carleton Place), as Mother of the Groom. I absolutely LOVED my hair & make up and left feeling relaxed, pampered and beautiful! Your staff is to be commended on their professionalism. This, paired with caring attitudes all round, makes your Salon top notch. The facility is gorgeous and immaculate which definitely adds to the serenity of the experience. 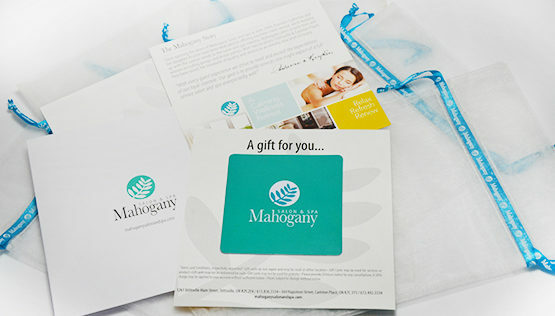 “My husband and I were so happy with our wedding day services at Mahogany. We were so grateful for all of Christine’s help, our wonderful Bridal Coordinator. Our wedding day ran so smoothly because of all of her hard work. We are very appreciative! We have just bought a new house together and can’t wait to start this new adventure. Thank you again for everything.” Kelly & Shawn G.